"The Democratization of Online Social Networks," "Adults on Social Network Sites, 2005-2009," and "The Internet and Civic Engagement." Dallas Morning News, October 12, 2009: "Seniors finding social networking exhilarating." 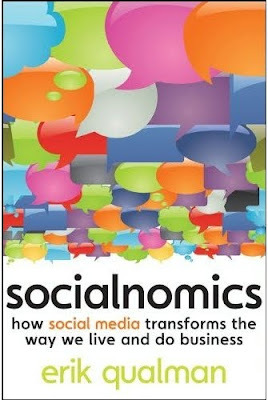 SOCIALNOMICS proves that social media is NOT a fad, rather it is a fundamental shift in the way we communicate. The term "disruptive technology" was coined by Clayton M. Christensen in his 1995 article "Disruptive Technologies: Catching the Wave" and 1997 book "The Innovator's Dilemma." In his follow-on book, "The Innovator's Solution," Christensen, an Oxford Rhodes Scholar, Harvard Business School Professor and much sought after business speaker, revised the term "disruptive technology" to "disruptive innovation." Christensen recognized that few technologies are intrinsically disruptive or sustaining in character. Rather, it is the innovative strategy or business model that the technology enables that creates a disruptive impact. Christensen: “The disruptive innovation theory points to situations in which new organizations can use relatively simple, convenient, low-cost innovations to create growth and triumph over powerful incumbents. The theory holds that existing incumbents have a high probability of beating entrant attackers when the contest is about sustaining innovations. But established incumbents almost always lose to attackers armed with disruptive innovations. . ."
In effect, "Disruptive Innovation" can change the rules of the game! Without the internet, Barack Obama would still be the junior senator from Illinois. Under the old media rules of the political game, a young man with a funny name and a couple of years in the Senate might run honorably, but would almost certainly lose, crushed by the ability of an experienced candidate like Hillary Clinton to raise money from big donors and lock up endorsements from elected officials and party activists. But, Barack Obama declared his candidacy in 2007, not in 1991, and his two-year campaign for the White House applied the principals of disruptive innovation in his use of new media technologies to overcome inherent advantages of well established incumbent candidates, like Hillary Clinton and John McCain. The new media communication strategies are disruptive to the old 20th century style campaign organization and communication strategies. The medium is the message, and like radio, the telephone and television before it, the internet has radically altered who is electable. Before television, there was a dramatically different set of candidates who could win that didn’t have a chance once television emerged. At first, campaigning on TV was viewed as a gimmick and was given to young staffers to experiment with. Over time, television asserted itself as the dominant form of political communication — remaking our nation’s politics in the process. If that progression sounds familiar, it’s because we’re reliving it today. New media leads voters to “expect more personalized, dynamic and interactive communications”, as Natch Greyer said of social media in the March 2011 US edition of Campaigns & Elections. What is more effective in creating a personal, dynamic and interactive relationship than face-to-face communications? The answer, of course, is nothing. A step back from the hyper-focus on social media to view how technology has affected politics in the past will provide better context to this inquiry. The arrival of the printing press in the late medieval period led to leaps forward in literacy rates, the Enlightenment and rationalism. In turn, it allowed a new form of mass identity and organization hitherto impossible. The written word did not simply allow for mass society, but also detached the argument from the author, allowing a new discourse remote from emotional ties enabling great scientific discoveries. HuffingtonPost: Clinton Slams Online Democratic Activists For Her Primary Losses to Obama. It should be obvious from Obama's 2008 Presidential Election that the web would begin to make a difference in political campaigning. But, there is still hesitation to use the Internet extensively in political campaigns. Hillary Clinton's 2008 presidential campaign dismissed the Internet many campaigns still ignore Internet mass media audiences and focus exclusively on old-school direct mail, phone banking, block walking and television. Less than 10% of political consultants believe the internet is an effective channel to reach voters. Huffingtonpost: "Social media" is merely a way to describe new tools in an old and narrow paradigm. However, this term has become obsolete in a world where technology has become a critical tool for connecting people not only to information and ideas, but also to other individuals, entities. The term "social media" as we know it today appeared in July 2004 as a reference to participatory media like blogging, wikis, social networks, and related technologies. This is all well and good if technology was still primarily about connecting people to information, which is really the essence of media. In this networked century, where access to technology is increasing exponentially, almost everybody is reachable. But more importantly, almost everybody has the ability to connect. This new ability to connect is leveling the playing field and breaking down previous age, gender, socioeconomic, and circumstantial barriers to who can emerge as a leader, activist, or grassroots agent for change. The power of technology today will be determined not by web traffic and viewership, but by its ability to strengthen and more importantly facilitate connections in real time. This post continues with several videos after the "Read more" jump. First up are four interview segments that Peter Leyden, former Director of the New Politics Institute, did for LinkTV in September 2008, as commentary for their airing of a documentary on the 2004 election. The first Leyden video segment introduces the new media political paradigm shift that occurred in the 2008 election cycle. Additional videos follow the Leyden videos providing more background on the new media revolution in 21st century politics. After President Barack Obama launched his 2012 campaign earlier this year his campaign team sent emails, tweets and Facebook messaging, including Facebook ads to ask nearly 13 million followers supporters from his 2008 campaign contact list to declare on Facebook "I'm In!" 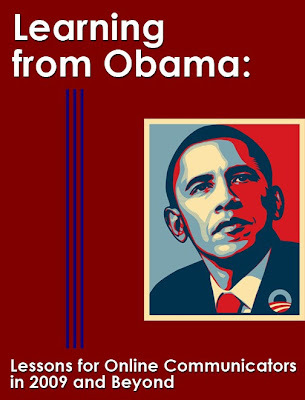 for Obama's 2012 re-election campaign. Emails to supporters seek small-dollar donations in exchange for campaign coffee mugs or a chance to win dinner with the president. The campaign's website helps supporters find local events, plan meetings and raise money while its digital team develops the next big thing. If Obama broke new ground in 2008 using email, text messages and the Web to reach voters, Obama version 2.0 campaign strategy plans to take the new media Web campaign to the next level – by taking advantage of the expansive roles that the Internet and social media are playing in voters' lives. "The successful  campaign is going to be one that integrates all the various elements of the digital channel – email, text, website, mobile apps, and social networks – together as one digital program and also mixing the digital program together with the offline reality of field organizations," said Joe Rospars, the Obama campaign's chief digital strategist. "In the end," Rospars said, "all the digital stuff is in service of the offline organizing to ultimately persuading voters and turning them out." When Obama was close to announcing his vice presidential selection of Joe Biden in August 2008, the campaign encouraged supporters to find out by text message, a move that prompted more than 2 million people to voluntarily give their cell phone number to the Obama campaign. Three years later, social media outlets like Facebook and Twitter have exploded, smart phones and apps are more prevalent, tablet computers are on the rise, and most Americans are online. When Obama announced his presidential campaign in 2007, Facebook had fewer than 20 million users worldwide. That number has now surpassed 500 million. "There's no online and offline organizing. There's organizing," said Jeremy Bird, Obama's national field director, during a session at Netroots Nation in Minneapolis. The hope of Dashboard is that data acquired by volunteers from voters canvassing in Ohio will immediately be synced with that gathered by those running phone banks in New Hampshire and with the outreach efforts of volunteers at myBarackObama.com, giving campaign bosses a real-time master view of the president's re-election efforts throughout the country. The Dashboard project is being led by Michael Slaby, one of Obama's digital gurus, along with Joe Rospars and Teddy Goff and Obama's director of field organizing Jeremy Bird. Collectively, they have been quietly reinventing traditional presidential races for the wired age. They have put together a team of more than 100 statisticians, predictive modellers, data mining experts, mathematicians, software engineers, bloggers, internet advertising experts and online organizers at the Obama For America headquarters in downtown Chicago, which has been laboring since its start to craft a new generation of digital campaign tools. They are keeping specific details about Dashboard heavily under wraps for fear that they might lose the substantial advantage they now enjoy over their rivals in the Romney campaign. They have also been keen not to reveal the tool until it has undergone substantial testing by staff. All that the Obama team will say is that it represents a major step forward that could "make a huge difference in how we organize for 2012". Dashboard, they add, will allow any volunteer for the first time "to join, connect with and build your neighborhood team online". The cutting-edge tool seeks to put in place what Obama's digital gurus tried to achieve in 2008 but ran out of time and resources within that presidential election cycle. Its aim is to amplify the electoral impact of campaign organizers and volunteers on the ground by connecting them to each other in real time and to the central HQ through the internet. The hope is that it will become the election equivalent of the Facebook games CityVille and FarmVille, where online participants cooperate with their social networks to run a city or manage a farm. In this case, Dashboard's creators hope to bring the power of the social networking right to the doorstep of the American voter. Staffers in key districts of vital swing states will be able to instantly access data on people in their locality who have subscribed to myBarackObama.com's e-mail list and might be willing to volunteer their time. In past elections, local staff and activists couldn't easily piggyback off the campaign's internet operation, and relied primarily on their own contacts and local knowledge about who to approach. Volunteers will also be able to log in to Dashboard through their mobile phones, giving them instant data on potential supporters and Obama voters as they canvass a neighborhood. "The Holy Grail for political organizers is the ability to see what impact you are having as you go door to door," said Eli Pariser, former director of the liberal campaigning website Moveon.org and CEO of the new sharing site Upworthy. "If Dashboard works as billed, it will import into politics the kind of feedback loops we are familiar with from Facebook and online games." Pariser also suggested that Dashboard could increase the contrast, already visible this year, between the Obama campaign's emphasis on on-the-ground engagement with voters, and the focus on negative TV advertising favored by the Romney campaign and the Republican strategist Karl Rove. 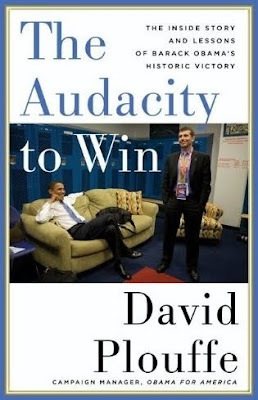 "The Obama campaign takes engaging with voters seriously and that's something that sets it apart from the majority of campaigns – Republican or Democratic," Pariser said. One of the key qualities of Dashboard, built into its make-up, is competitiveness. The tool's designers hope that by making local data available to volunteers and staff, it will encourage neighborhood teams to have a healthy ambition to be the best in meeting targets for the number of calls made, doors knocked upon and new voters registered. "It's like a personal fundraising thermometer, but at scale and applied to field organizing," Teddy Goff, the Obama campaign's digital director told Rolling Stone earlier this year. Dashboard could prove to be a powerful weapon for the Democrats not just in 2012 but in future Congressional and presidential races. The Guardian understands that unlike previous efforts, where digital innovations have been owned by Rospars' private company, Blue State Digital, Dashboard has been built from scratch in-house by the Obama re-election team. It is not clear what will happen to the technology after 6 November, but it is likely that the Democratic National Committee, the party's organizational hub, will want to keep a handle on it. The web emerged as a star campaign player in 2008, and Obama used it to unprecedented effect to thump rival John McCain. Now Republicans are re-arming. “We lost the technology battle in the 2008 cycle, without a doubt, and we could not stand by and get away with just having (campaign) centers make telephone calls and knock on doors,” RNC political director Rick Wiley told AFP at the committee’s Washington headquarters. Romney, the presumptive nominee, needs a vibrant online presence to galvanize support as his campaign enters a summer lull before the party nominating conventions in late August. In its new app the RNC seeks to recreate the volunteer experience online, eliminating geographic boundaries to allow Republicans in red states like Texas to impact the dozen or so swing states that will decide the November election. Both sides have capitalized on YouTube to stream press conferences, weekly addresses or online campaign videos for free, making the medium the “fireside chats” of their era. But social media in particular will have an extraordinary impact in 2012. “I can tell you right now that social marketing will swing millions of votes in this election,” said Scott Klososky, an author and expert on social technology. WSJ Online: Services like Twitter, Facebook and Google Wave create a constant stream of interaction among users—for better or worse. Email has had a good run as king of communications -- But its reign is over. In its place, a new generation of services is starting to take hold—services like Twitter and Facebook and countless others vying for a piece of the new world. And just as email did more than a decade ago, this shift promises to profoundly rewrite the way we communicate online through conversation -— in ways we can only begin to imagine. We all still use email, of course -- But email was better suited to the way we used to use the Internet—logging off and on, checking our messages in bursts. Now, we are always connected, whether we are sitting at a desk or on a mobile phone. The always-on connection, in turn, has created a host of new ways to promote conversations that are much faster and more effective than email, and more fun. 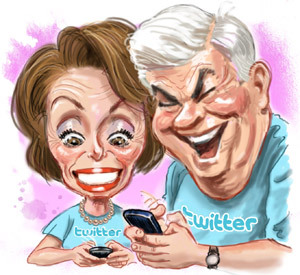 Democrats more successfully used digital media and social networking tools like YouTube, Facebook, Twitter, MySpace, Email, Test Messaging and a variety of other digital age tools than Republicans in the 2006 and 2008 election cycles. Unfortunately, Republican candidates and conservative advocacy groups are also adopting advanced digital campaign strategies at a rapid pace. Tea party groups, conservative advocacy groups and GOP candidates, like incumbent Gov. Rick Perry, are moving rapidly to supplement and even replace the standard 20th century campaign practices with 21st century advanced digital campaign strategies. Bill White's Web Ads are popping everywhere. [White was the Democratic Candidate ramping up to run for Kay Bailey Hutchinson's (R) Senate Seat, but switched races in late 2009 to run against incumbent Tx Gov. Rick for the 2010 election] Below are two examples of Bill White Web Ads that appeared in interesting places. Pew Research Center for the People & the Press: Trends in the opinions of America's youngest voters are often a barometer of shifting political winds. And that appeared to be the case in 2008. 58% of voters under age 30 identified or leaned toward the Democratic Party, compared with 33% for the GOP. The Democratic Party's 2008 lead among young voters doubled from 11 points to 25 points from 2004 to 2008. 66% of under-30's supported Obama; far higher than in any previous election - compared to 31% for McCain. Online facts: 90% of adults under age 30 and 70% of adults age 50-64 regularly use the internet. 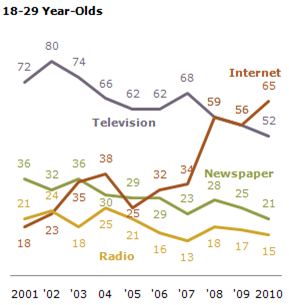 50% of adults under age 18-29 say the Internet is their main news source. Obama received a blowout 66% of the national vote among the 18-29 year old age group in 2008 compared to McCain's 33% of that vote. Obama even won the youth vote in many Republican states like Texas, where he won 54% of the vote. The youth also voted 63% for House Democrats in 2008 -- Young voters not only voted for Obama at the top of the ballot, they also voted down ballot or straight ticket for other Democratic candidates. 18 percent of the 2008 electorate was made of the 18-29 year old age group and by 2016, they will be 100 million strong and positioned to dominate the American political scene for 30-40 years. The Internet is producing the most socially plugged in, caught up, networked and aware generation since — ever? Listen to this hour of On Point discussion on Gen Web. A big new study looked at new American youth culture unfolding on the Internet. The prevalence and use of wireless telephones (also known as cellular telephones, cell phones, or mobile phones) has changed substantially over the past decade. Today, an ever-increasing number of adults have chosen to use wireless telephones rather than landline telephones to make and receive all phone calls. December 22, 2011 update - In the first 6 months of 2011, more than 3 of every 10 households (31.6%) did not have a landline telephone but did have at least one wireless telephone according to a CDC survey covering the January-June 2011 period. Approximately 30.2% of all adults (approximately 69 million adults) lived in households with only wireless telephones; 36.4% of all children (approximately 27 million children) lived in households with only wireless telephones. The percentage of households that are wireless-only has been steadily increasing. The 1.9-percentage-point increase from the last 6 months of 2010 through the first 6 months of 2011 is not quite as large as the 3.1-percentage-point increase from the first 6 months of 2010 to the last 6 months of 2010. However, it is similar in size to the increases observed for the previous two 6-month periods. A 1.8-percentage-point increase was observed from the first 6 months of 2009 through the last 6 months of 2009, and a 2.1-percentage-point increase was observed from the last 6 months of 2009 through the first 6 months of 2010. The percentage of adults living in wireless-only households has also been increasing steadily (Figure 1). During the first 6 months of 2011, 3 of every 10 adults lived in wireless-only households. One year before that (i.e., during the first 6 months of 2010), one of every four adults lived in wireless-only households, and 2 years before that (i.e., during the first 6 months of 2008), only one of every six adults lived in wireless-only households. The percentage of children living in wireless-only households is also growing. In fact, as seen in Figure 1 and Table 1, the percentage of children living in wireless-only households has been increasing substantially faster since 2009 than the percentage of adults living in wireless-only households. According to a December 2010 Pew Research Center's Internet & American Life Project research report a key fact to keep in mind is that younger cell-only age groups regularly use FaceBook or other social hubs. Milliennials, those ages 18-33, are more likely to access the internet with a mobile phone and milliennials still surpass their elders in use of social network sites. First, it must be made clear that Obama’s "new media" department was NOT a part of the campaign’s "tech team." Instead, it was an independent branch of the campaign, coequal with communications, field and finance, and was in fact as much a client of the technology folks as, say, the press department was. Like other department heads, new media team leader Joe Rospars was a central part of the campaign’s top-level planning and decision-making processes, and he reported directly to overall campaign manager David Plouffe. The biggest story of the U.S. midterm election has been the growing influence of the Tea Party movement. Since their first rallies in early 2009, these vocal, visible conservatives have succeeded in shifting the center of American political discourse to the right. This election cycle, Tea Partiers have gone a step further, successfully backing primary challengers against moderate Republicans like Delaware's Mike Castle. So how has this confederation of online, conservative activists used new media to build their growing political base? Click here to read the entire PBS series on this topic. Plouffe is credited with the campaign’s successful overall strategy in the race for the Democratic Party presidential nomination and the general election by maintaining discipline over communications to deliver a consistent campaign message through a broad spectrum of media channels. Obama's success owes a lot, of course, to his message of "change," but there was something more subtle at work, too. It was not just the message and the man and the speeches that swayed Democratic voters, it was the way the campaign folded the man and the message and the speeches into a systemic branding effort. 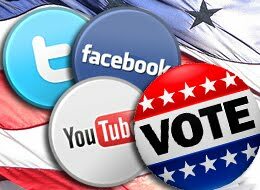 June 2011 by digital agency SocialVibe found that 94% of voting-age social media users are more likely to watch an entire political message viewed online, and then 39% will share it with an average of 130 friends. Online politics may look new, but most of what a campaign does over the internet is really just a reincarnation of some classic political act. For instance, think of a website as the electronic version of a storefront office, while the process of working with bloggers is a lot like old-school print or broadcast media relations. But compared with traditional political tools, the internet truly excels at maintaining relationships with many people at once. Channels like Facebook, Twitter, YouTube and in particular email connect campaigns directly with their donors and volunteers, providing a means to distribute news, messaging points, event invitations and appeals for time and money. With planning and effort, the connection can go both ways, letting a campaign actively tap the social connections and even the creativity of its supporters. Political professionals trained in the broadcast era often have trouble adapting to the back-and-forth nature of online communications (TV ads aren’t exactly interactive), but the rewards for embracing it can be tremendous. As Barack Obama showed in 2008, campaigns that actively engage their supporters can ask an immense amount from them in return. Once a campaign has the basic technology in place, it can begin to take full advantage of the Internet to deliver donors, volunteers and voters back to the campaign website. With new social communities like blogs, Facebook, YouTube, MySpace and Twitter creating fresh fishing holes, much of a campaign’s online outreach will take place in very public venues. But politicians and their staffs can also reach out behind the scenes, for instance sending emails or Facebook messages to selected bloggers, tweeters and activists, usually in the hope of creating connections that will lead to more public affirmations of support. Campaigns can target online advertising with a different kind of precision, reaching people with appeals and messages that match the content they’re reading or the keywords they enter into a search engine. The variety of outreach outlets available to online communicators can be overwhelming, so let’s start with a few basic principles to help sort out the options. Google Docs lets you create, share, and collaborate on documents online. Sharing your Google Docs while maintaining control over who can access your files. Email has been the most common way to communicate online, even for a political campaign. Most campaigns have their own email address with their own domain name (like Michael@michaelfortexas.com). An alternative to paying for a commercial Internet service provider (ISP) for a website domain with email email is a very power and free solution: Google Apps. As long as you have fewer than 50 users the system is free. The domain (i.e. www.michaelfortexas.com) is linked to a Google email server. The interface looks almost exactly like a gmail account. You have access to not only email, but docs, calendar, etc. Furthermore, it provides smart phone access with Google’s phone application, Google Sync. Google Apps is a great solution for any campaign. It is relatively quick to set up so if you have a simple site with a tight budget, you might as well tell your webmaster to go ahead and set it up. At the very least, having your domain name in your email address would be free advertising. Google Groups lets you quickly find and and participate in ongoing discussions among group members. Google Groups is a little like using email to create and post messages. But Groups is a discussion forum where all members can read and respond to discussions in various topic threads. Google Docs lets lets multiple people collaborate together to concurrently read and update one copy of documents like spreadsheets, slide presentations and word docs. You'll be able to stay in the loop even when you're on the move, with the new mobile browser experience. Mr. Willington said in an interview that the campaign made so much use of Google apps because the tools were efficient and readily available to campaign workers. “We didn’t have much money,” he said. “We needed to be as efficient and quick as possible.” He said he wouldn’t have exact figures on the campaign’s online ad budget until after the election. Watch video of a Sept. 30,2009 talk by Dhavan V. Shah, an expert on the social psychology of media influence on political judgment. Modern political campaigns involve, and increasingly rely on, advertising and digital media. President Obamas recent campaign was a prime example of how effective use of the Internet can influence voters. Shah is the Louis A. & Mary E. Maier-Bascom Professor of Journalism and Mass Communication and Political Science at the University of Wisconsin-Madison. He received his doctorate in mass communication in 1999 from the University of Minnesota, where he also minored in political psychology. His research concerns the social psychology of media influence, especially communication effects on political judgment, public opinion, lifestyle politics and civic participation. Shah has authored more than 60 articles and chapters and is currently working on three books. The Evolution of Campaign Websites. Watch this five part series of videos with Professor Christine Williams as she comments on Blogs, Social Networks and E-Politics. Christine B. Williams is a Professor of International Studies and Government at Bentley University. She studies political communication with an emphasis on new and emerging technologies. Recently her research has focused on Internet-hosted technologies. In 2000, Professor Christine Williams and her research team began analyzing the content of U.S. House and Senate campaign websites, a research project that has continued through the campaign cycles of 2004 and 2006. She is now analyzing Election 2008. While progressive blogs, with the encouragement of DNC Chairman Howard Dean, helped power Democratic electoral wins in 2006 and 2008, many in the Democratic party have been reticent about, and towards, its blogosphere echo chamber and the even the adoption of new media tools and strategies. Nearly twice as many Republicans as Democrats have accounts on the social networking platform Twitter (101 compared with 57), and the GOP dominates Twitter usage by an even wider margin, according to a report released this week by the Congressional Research Service that analyzed two week long periods in July and August. Personal Democracy Network: Listen to Phil de Vellis, a senior associate and Vice President of New Media for Murphy Putnam Media, talk about employing digital media tools for political campaign support. Philip has a wide range of professional experience in commercial post-production, politics, and Internet communications. He is best known as the creator of the "Vote Different" ad, which combined Apple's iconic "1984" spot with footage from Sen. Hillary Clinton's campaign website. Listen to Kate Albright-Hanna, Who Worked On Obama's Campaign, Discuss Using Online Video to Grow A Candidate's Campaign. Persuasion comes in many forms. It happens when people are persuaded to click a web ad or text to a SMS short code message to begin a conversation that ultimately builds into a relationship. Through the conversation and relationship people be persuaded to give money, or send their e-mail address and cell phone number for future communication, to follow on Twitter. The ultimate goal is to engage people to become foot soldiers in the campaign through both online and offline activities. Personal Democracy Network: Listen to the discussion on "A Case Study On Using Twitter for Fundraising and Community Organizing." How selling politicians is the same as selling soap. The following video is an example of the type of video political volunteers and activists can create with a home video camera, post on YouTube and then embed in a local blog or website. The art of relationship management is not new and can be found in many forms, addressing specific constituency relationships like business to customer, non-profit service organization to donors and political parties and candidates to voters. In the business world customer relationship management (CRM), focuses on business success by maximizing an organization's ability to identify and track customers' needs and behaviors in order to develop stronger relationships with them. In the sphere of politics constituent relationship management (CRM), similarly focuses on electoral success by maximizing a party’s or candidate’s ability to identify and track voters' views and behaviors in order to develop a relationship with them and motivate them to vote. Just as CRM has been automate through web software systems over the last two decades, CRM automated through web software systems. This country saw a huge increase in voter registration during the 2008 presidential election year, including big numbers among younger voters, people of color, non-college voters, as well as college students, and unmarried women. These groups of newly registered voters are politically progressive and disproportionately Democratic. The problem progressives faced in 2008, just as in prior election years, is that not all of this energy was transferred to down ballot races. An EMILY's List survey conducted that year by Garin-Hart-Yang Research Group shows that 65 percent of younger people believe whoever is elected President will make "a lot of difference" in their lives; this number drops to 32 when asked about Governor and 26 percent when asked about Congress. This post contains content that may be useful to those who intend to attend a party convention as a delegate or who just want to learn a useful set of meeting skills. Robert's Rules of Order is the short title of a book containing rules of order intended to be adopted as a parliamentary authority for use by a deliberative assembly. Published under the name Robert's Rules of Order Newly Revised (and often referred as RONR) it is the most widely used parliamentary authority in the U.S., according to the National Association of Parliamentarians. Updated Jan. 6, 2012 - The Robert's Rules of Order Newly Revised, 11th edition, published in 2011, is intended to replace all previous editions as the parliamentary authority in organizations whose bylaws prescribe “Robert's Rules of Order,” “Robert's Rules of Order Revised,” “Robert's Rules of Order Newly Revised,” or “the current edition of” any of these titles, or the like, without specifying a particular edition. Gerald Smith was the first sigma appointed as national director of Phi Beta Sigma Fraternity serving from 1978 until 1990. His purpose for producing this training video series was to educate the delegates in parliamentary procedure so they would be able to take control of their fraternity as well as other African American organizations of which they where members. "Citizen journalism" describes the different kinds of journalism people can do on their own, without media companies or professional salaried journalists necessarily involved. This can be as simple as regularly commenting on news story in the Dallas Morning News that adds information or perspective the reporter left out, writing letters to the editor or as demanding as self-publishing a news and editorial blog on the Internet. Arianna Huffington, Co-founder and Editor in-Chief of the Huffington Post, talks about citizen journalism and the role it can play in the years to come. Citizen journalists are members of the public who "play an active role in the process of collecting, reporting, analyzing, fact checking and disseminating news and information," according to the seminal 2003 report, "We Media: How Audiences are Shaping the Future of News and Information." Authors Bowman and Willis say, "The intent of this participation is to provide independent, reliable, accurate, wide-ranging and relevant information that a democracy requires." The idea behind citizen journalism is that citizens can exercise their right of free speech by using the tools of modern technology and the Internet to augment and fact-check corporate media companies, either on their own or in collaboration with others. Ever wondered what all the fuss is about concerning Barack Obama's use of so called "new media" tools during his 2008 presidential campaign? This blog, hopefully, provides some of the answers to your questions. The articles in this blog were last edited to update content with current information during April 2011. This Blog is not operated by the Democratic Party. This blog is operated by Texans for the benefit of all Texans. No money is accepted or expended in the publication of this blog.